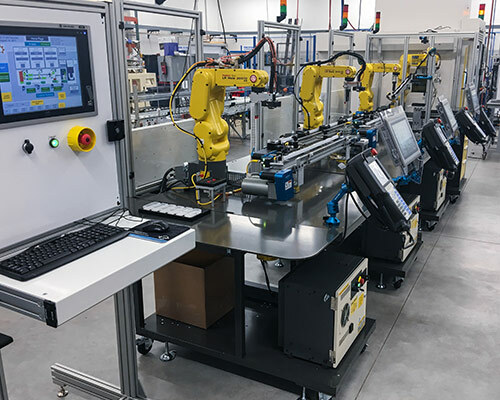 The CSM (Connected Smart Manufacturing) is an Intelligent manufacturing system using the latest Industry 4.0 connected advanced manufacturing equipment and techniques to produce a promotional product you can be proud to have your name on. 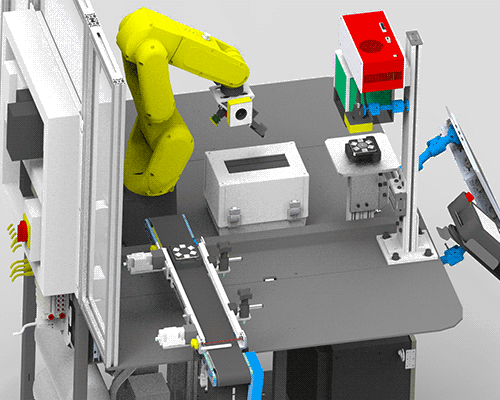 The system proposed is a four-robot manufacturing cell, working in conjunction with a CNC Mill and utilizing one APT MTEC machine tender CERT cart and three APT LR Mate CERT cart bases, modified to perform the tasks described. This complete package is a great teaching tool to work with the students that are in Robotics, CNC Machining and PLC Programming. This will machine a block of anodized aluminum into a nice dice holder, from then we will have a robot as a machine tender utilizing the APT MTEC CERT cart. The robot will remove the machine block, go through an inspection process, a cleaning process and now a laser engraving process. During the engraving process the students will learn to customize the engraving per the school logo, their name or a picture that they can be creative with. We will then use vision to look for 6 dice and the correct dice, numbering 1-6, that we can teach the robot to pick up in different orders. This allows the student to be creative as he/she would have to in the manufacturing world. We would then package the assembled product into a gift box that the students and schools can be proud of. This cell will highlight machining technology by using a 3 axis CNC vertical machining center (CNC machine not included). Each station will have its own PLC, HMI, robot and learning station to teach from. The stations can then be put together as a complete line. This is real manufacturing when different programmers and employees are working together to complete a large project. 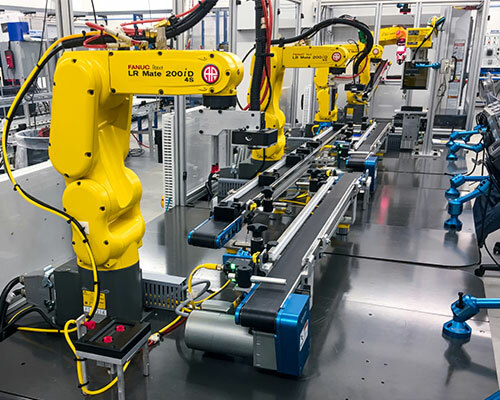 The process will be fully autonomous using Fanuc intelligent robotics with vision, Rockwell PLCs, Smart sensor IO Link technology, and RFID process tracking. Without human interaction the cell will perform all the material handling and manufacturing tasks to create the promotion item. To perform these tasks, there will be workstations, known in industry as OPs. 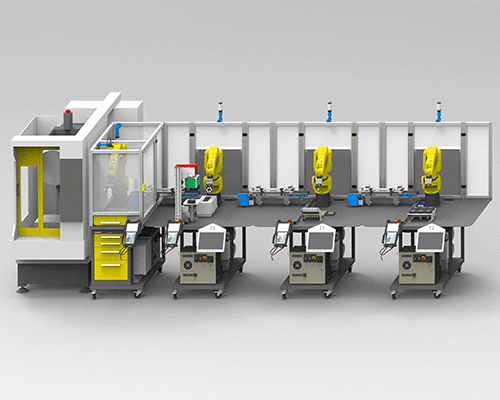 Each OP is a modular robot station with specific project objectives and ancillary devices. 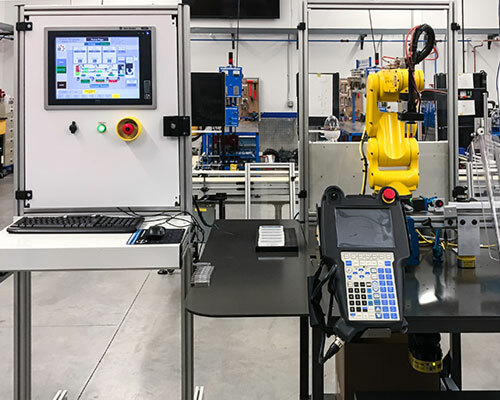 Each OP workstation is controlled from a PLC control panel attached to the robot cart with communication via Ethernet IP (industrial protocol) from cell to cell to operate as a complete integrated system. From the cell master control interface, the production operation schedule will be set. This includes information such as laser etching, batch count, package quantity, etc. 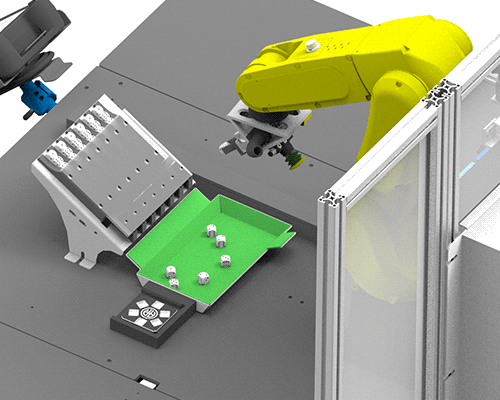 With blank parts loaded into the system, the cell will run and perform all tasks autonomously.